When a child is sick, parents need clear, reliable information to help them take action quickly. 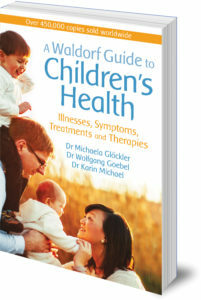 A Waldorf Guide to Children’s Health is a fully comprehensive guide to child health and wellness which draws on anthroposophic medicine, combining conventional treatments with complementary therapies. As the nights get darker, the weather gets colder, so the sounds of sniffles and sneezes fill the air… As winter comes, so do colds. We hope you’ll find this extract from A Waldorf Guide to Children’s Health helpful if your child catches one! Encourage your child to drink plenty of water. A sick child should avoid excitement and be allowed to sleep a lot. A little doll or a gnome who peeks out from under the covers or climbs pillow mountains will provide hours of amusement. Provide fresh air that is not too dry. If necessary, use a vaporiser or hang damp cloths in the room. Spread a little eucalyptus oil, Olbas oil or Babix Inhalat on a cloth or saucer and set it on a heat source in the room (not in the bed, and not for children who have asthma). For nasal congestion, steam inhalation with chamomile tea can help to clear the nasal passages and prevent infections. Create a “tent” using a towel over two chairs, with a large, stable pot in the middle to hold the tea. An adult can inhale steam along with a baby for 5 to 10 minutes, and older children can do it alone for up to 15 minutes. If your child is coughing, rub their chest with 10% lavender or mallow oil. Alternatively, use chest rubs with or without hot, moist compresses. If your child is shivering, keep them warmly covered. If needed, give your child hot tea to drink and pile on extra covers to induce sweating. Afterwards, change them into dry bedclothes. Pay attention to warmth. In particular, keep your child’s head, ears and feet warm. The common “cold” needs to be taken literally! Make sure your child gets enough fresh air and exercise. Echinacea syrup can be used to stimulate the body’s own healing forces. The dosage is ½–1 teaspoon, 3 times a day for 4 weeks. A definitive alternative guide to children’s health and wellness includes first aid, how to treat common complaints and illnesses and advice on when to seek medical help. Based on the bestselling A Guide To Child Health, this essential reference guide has been fully revised and updated for today’s parents.